What’s it like for YOU to live with migraine, tension-type headache, cluster headache, NDPH, CDH, or another headache disorder? Share your thoughts in the 30 Things meme! It’s 30 questions about your headache disorder that lets you tell your story. You can even remain anonymous, if you’d like. You’ll get a link to a page with your story, which you can share as you like. 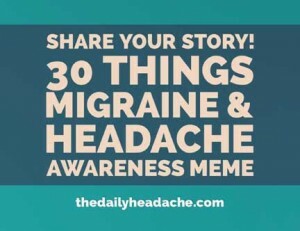 June is Migraine and Headache Disorders Awareness Month—the 30 Things meme is a great way to share what it’s like to live with a headache disorder. Enter your name (or a nickname, if you prefer). Copy and paste the questions and your responses into that form. Be sure you’ve filled in all the fields (your submission won’t go through if you don’t). Within 24 hours, I will moderate your submission and it will be published as an individual post with a URL you can share. Check the 30 Things Meme category for your post then click on your post title to get the URL. To submit your post, complete the form below. You must fill in every field for your submission to go through (your name and email will not be published and I won’t send you spam). Within 24 hours, I will moderate your submission (to prove it’s not spam) and it will be published as an individual post with a URL you can share. Check the 30 Things Meme category for your post then click on your post title to get the URL. 1. 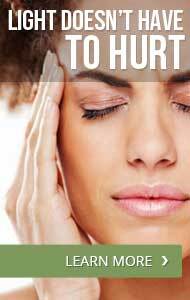 I have had chronic daily headache (CDH) for __26__ years. 3. After the headache started, it took about a year to get a diagnosis. 7. Treatments I have tried include: jaw operation, osteopathy, acupuncture, massage, rolfing, healing, and many more! 19. I get angry when people say: cheer up! Thank you so much for the opportunity to share 30 Things”; and I take solace in the fact that I am not alone and I can learn so much from my fellow migraine warriors, such strong and resilient women and men. Many thanks for your kind comment, much appreciated. Thank you for all you do, it’s very good to know we are not alone! Thank you for sharing! I feel like I could be looking in the mirror. The only person who truly understands what a migraineur is another migraineur. This debilitating disease is so isolating and potentiality depressing that finding people who understand are a truly a lifeline. Bless you and continue having hope, my best to you and your family.